During SXSW Film Week, more than 200 filmmakers had the opportunity to share their films and documentaries. So many of the participants were first time writers, directors and editors, and it was exciting to see them carry on the tradition of using Avid’s industry leading technologies used to create the most beloved movies and documentaries in the world. 1. Hawking: Hawking, edited by Timothy Lovell, is the story of the world’s most famous living scientist, told for the first time in his own words and by those closest to him. Made with unique access to Hawking’s private life, this is an intimate and moving journey into Stephen's world, both past and present. Hawking shares his incredible personal journey from boyhood under-achiever, to PhD genius, to being diagnosed with Motor Neuron Disease and given just two years to live. Despite the constant threat of death, Hawking manages to make many remarkable scientific discoveries and rises to fame and super-stardom. Lovell cut the film on Avid Media Composer. 2. Mobile Homes: Mobile Homes follows Ali, a young mother trapped in human trafficking. Constantly moving from city to city, she is transported with her 7-year-old son Alex. As she survives day to day, Alex explores mobile home sales-lots in the hopes of establishing a permanent home. Vladimir de Fontenay, writer, director and editor of the film, cut the film with Avid solutions. Sound Editor Scott Hirsch mixed the sound for the film with Pro Tools. 3. 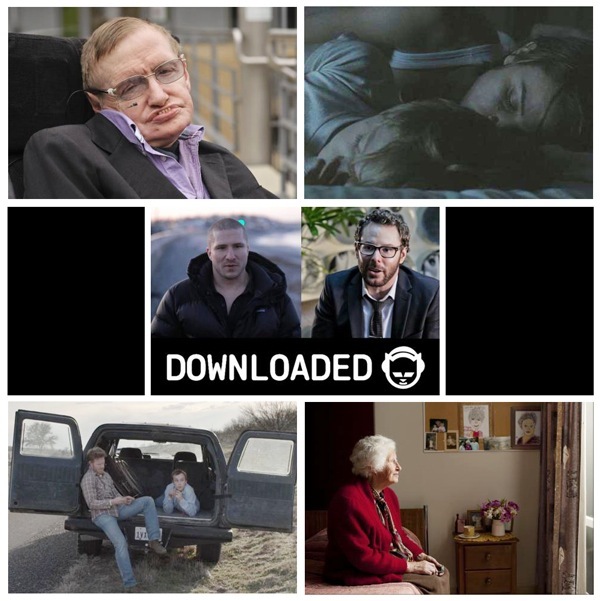 Downloaded: In 1998 Shawn Fanning, a teenage hacker and programmer, created the code that would become the basis for all peer-to-peer file sharing. In 1999, Fanning and his business partner, fellow teenager Sean Parker, launched the file-sharing service Napster. And what began as a largely unknown underground distribution medium erupted into a full-blown global revolution. Downloaded explores this revolution from its genesis to its peak, and explains Napster's downfall. Editor Jacob Craycroft, who worked with director Alex Winter, said that Avid is the only editing solution he used for this documentary. 5. This is Where We Live: Lee Salevan used Pro Tools to edit the sound for This is Where We Live, a portrait of the Texas Hill Country-based Sutton family. Diane, while ignoring her own health issues, is caregiver to her son August, who has cerebral palsy, and her husband, who is in the early stages of Alzheimer's. Overburdened, she hires Noah, a local handyman, to build a wheelchair ramp up the front steps to the family home. August observes Noah working, and through dinner with the family. Diane notices their connection, and stops Noah as he leaves to ask if he could use some money helping out with August. The friendship that Noah and August forge has a ripple effect; life makes unexpected turns for those around them, and forces Noah to confront his past. Next week we’ll share some insights about Avid’s experience at SXSW Music week. For now, we leave you with a Vimeo playlist with trailers from these films. Have a great weekend! In the world of sports broadcasting, ensuring fans in every location—at home, on the go, at the sporting event—are up-to-date on the latest score, popular play or controversial call is essential. As a result, sports broadcasters face the challenge of amusing thousands of people via the scoreboard reel—displaying both archived highlights clips, as well as high-definition instant replays of fresh coverage—while contending with live streaming, on-air graphics needs and, social media content distribution in (almost) real time. So just how do production teams behind broadcast sports events answer fans’ needs for on-demand content? 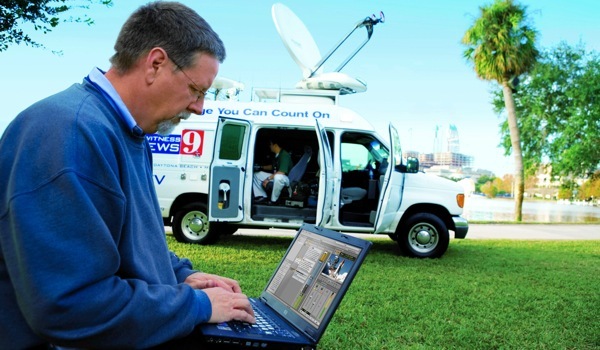 They master the art of multidimensional sports broadcasting with help from Avid solutions. In the NAB session, “Beyond Instant Replay: A Look at the Technology Behind Sports Broadcasting,”during NAB 2013 next Tuesday, April 9, Paul Hodges, executive producer, San Francisco Giants, and Rich Gentile, senior director, Broadcasting and Multimedia Production, New York Jets, will explain how their organizations have increased their reliance on integrated workflows and media asset management to mitigate sports broadcast challenges and ultimately deliver accessible, relevant, and entertaining coverage to the most die-hard fans. See the full details for the Beyond Instant Replay session and see what other NAB sessions customers or Avid specialists are leading by visiting Avid at NAB 2013. We’ll see you next week on the NAB show floor. Now in its 16th year, MediaMotion Ball is the premier gathering for everyone working in production, post-production and motion graphics design. MMB features live music, lots of prize giveaways (including some killer giveaways from Avid), full gourmet meal, great wine, delicious desserts and most importantly mingling opportunities. 2012 was my first MMB and the folks I met where a "Who's Who" of the industry. The MediaMotion Ball is returning to the Monte Carlo and we’re super excited to be sponsors again this year. We’ve got a great team of Avid peeps ready to mix and mingle, plus demo expert extraordinaire Bob Russo will be there to do hands-on demos of the latest and greatest in the world of Avid post production. We can’t wait to see you. Here’s the scoop. RSVP: Sign-ups and $49 advance ticket purchase are NOW OPEN. Tickets include a great catered meal and entry into the prize draw. The 2012 attendance smashed all previous records. Despite having a larger venue, they sold out all 372 tickets very early (oversold actually) and jammed the room. This is one of the hottest tickets of NAB. Marianna Montague (Avid Customer Advocate), Carey Dissmore (MMB Organizer) and Bob Russo (Avid Post Production Specialist) sharing a few laughs, and reminiscing about MMB #1. Somebody tell that guy in the lower-right corner to stop Tweeting on his iPad and pay attention to the presentation. See you at 5:30 PM on Monday at the Monte Carlo Hotel Ballroom! The PBS Technology Conference is only a few days away, April 3 – 5 in Las Vegas. In the meantime, our Avid experts are busy putting the finishing touches on their product demos. Conference attendees will see first-hand how Avid content creation tools and production solutions create the most fluid end-to-end, distributed media production environments in the industry. 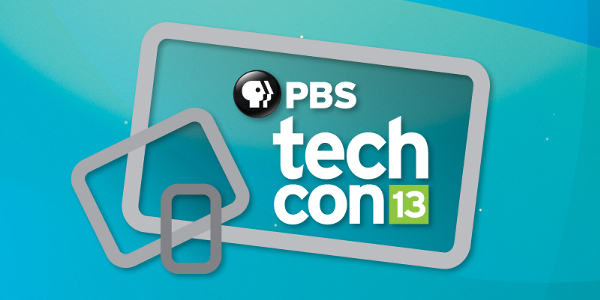 If you’re headed to the PBS Technology Conference, see our solutions in action when you visit Avid Booth #209-211. If you’re unfamiliar with this conference, here’s the low down—the PBS Technology Conference serves as a forum for education, professional development, and exposure to new ideas and technologies, as well as a chance to network and visit with friends and colleagues. Learn more and register to attend. 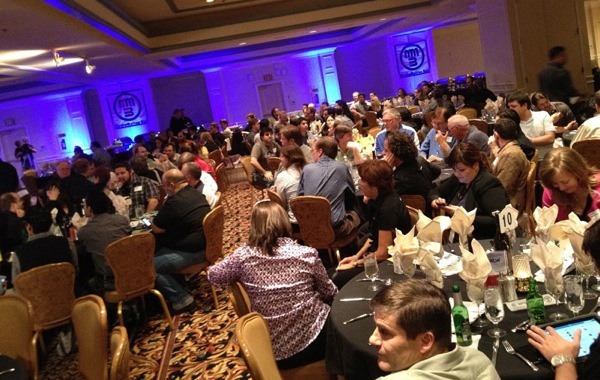 For the full scoop on all the events we’re sponsoring, Avid at NAB 2013 has the details. While you’re there, be sure to sign up to receive daily show updates! PS: PBS Technology Conference attendees receive a special gift for participating in a personal demo at our booth. First come, first serve, while supplies last! NAB 2013 is less than two weeks away and we're busy gearing up for a memorable experience. During NAB, we’ll have game-changing product announcements, celebrity stage presentations, state-of-the-art demos, special events, customer meetings and more. To stay up-to-date on our latest news from the NAB show floor, register for daily show updates. 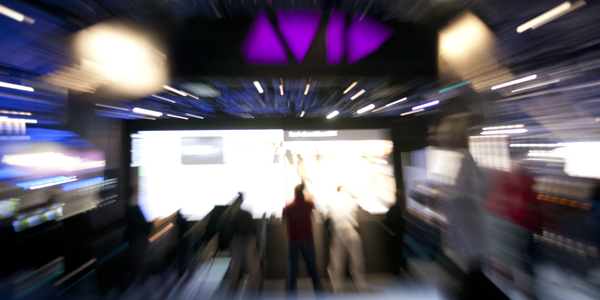 Once the NAB 2013 exhibit floor opens on April 8, everyone who registered for the updates will receive a daily email alert with news and announcements from the Avid booth and beyond. 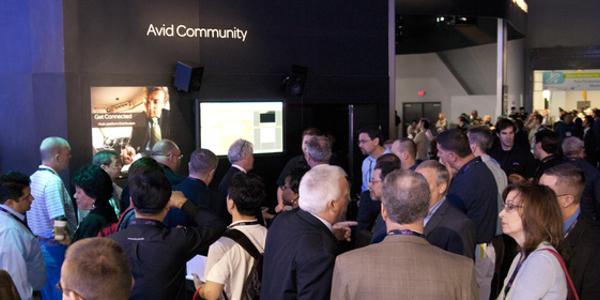 Speaking of our Avid booth—#SU902—have you seen what we have in store for customers? No? Now is your chance. Product Demonstrations — every day during NAB from 9:15 a.m. – 5:15 p.m. Avid experts will showcase Connected News, Media Composer, Pro Tools and Avid Motion Graphics during product demos on our main stage. Get up and personal and have your questions ready to be answered during the demos. Guest Presentations — stop by and hear a our customers speak about how they use Avid solutions every day on a variety of audio, video and sports projects. Guest presentations include: Making the Switch from FCP to Avid; Real-World Use of Pro Tools in Editing and Mixing Feature Films; Bringing Game of Thrones to Life; St. Louis Cardinals Keep Fans Engaged; and Oscar-Winner William Goldenberg Talks Argo and Zero Dark Thirty. See schedule details. Hear all the latest news by signing up for our daily show updates and check out the Avid at NAB 2013 for more details about our product demonstrations, guest presentations, NAB sessions and Avid sponsored events. We look forward to seeing you at NAB 2013! PostChat is a weekly Twitter-based chat, centered on the hashtag #PostChat. For one hour every week, editors and post professionals around the world turn their attention towards Twitter to engage in an hour-long discussion about the technology and the art of post production. Big events like NAB offer the opportunity to take those discussion to the real-world—and we’ve done just that. If you’re headed to the NAB Show next week, make a spot on your calendar to join PostChat and the Avid team at the official editors’ TweetUp of NAB. Here’s the scoop. Come to mix and mingle, meet the folks behind the Twitter handles and pick-up those discussions from prior weekly Wednesday chats. Avid folks will be on-hand and I hear we’ll have some raffles to give away too. Never participated in a #PostChat? No problem. First-timers are more than welcome. PostChat is scheduled and hosted each week by post production pros @dr0id, @tejbabra, and @artguillotine. This will be PostChat's second annual TweetUp in Las Vegas, the first time as an official NAB Show TweetUp. 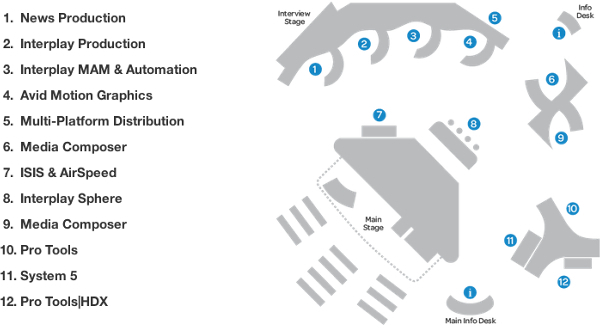 See you at 4PM on Monday in the South Hall upper level, just a few steps away from Avid @ NAB 2013 booth #SU902. PS: We’re also excited to meet-up with you at MediaMotion Ball. We’ll be sure to leave plenty of time to get from South Hall to Monte Carlo Hotel, when the MMB doors open at 5:30. This year, Avid participated in SXSW Film Week and Music Week to connect with some of our artists and to get a look at the up-and-coming talent in both industries. Film Week began with the Avid-sponsored Troublemaker Studios and SXSW Filmmakers lunch. Nearly 250 of the festival’s accepted filmmakers joined together at the studio, which is owned by filmmaker Robert Rodriguez and producer Elizabeth Avellan. While many people typically wait for three hours in line to dine at Franklin Barbecue, only to be turned away with an empty stomach, the filmmakers enjoyed catering from the restaurant and had the opportunity to network with their peers. Rodriguez addressed the attendees, including a number of first-time filmmakers. He explained the importance of reaching out to one another and participating in local art communities. 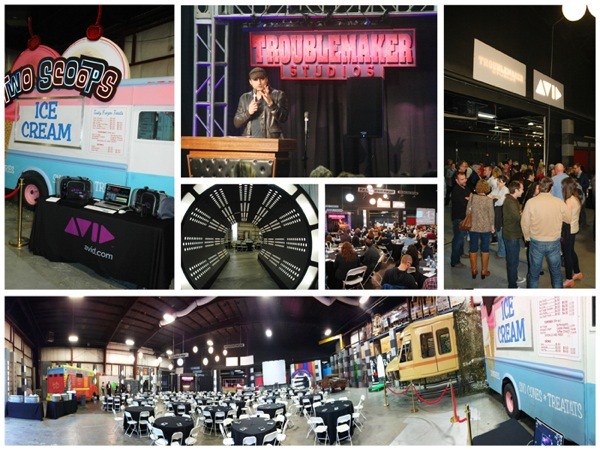 "The Troublemaker Studios tour and luncheon has become the main kick-off event for visiting filmmakers to SXSW, and we were very excited to again have Avid as part of this great meeting of creative minds," Rodriguez said. Troublemaker also shared props and set pieces from Rodriguez’s films, including “Desperado,” “Spy Kids,” The Adventure of Sharkboy and Lavagirl,” “Sin City,” and “Grindhouse,” which were displayed around the studio where the lunch was held. Next week we’ll give you some insight into some of the amazing independent films screened at SxSW that were edited with Avid solutions. For now, we leave you with a playlist of some of the great songs that make up the sound tracks of Rodriguez’s films. 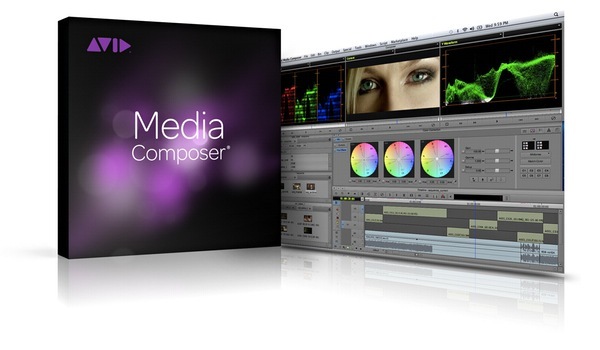 HDVideoPro writer George Avgerakis recently put Avid Media Composer through its paces, with the stellar results documented in an article published this month. Avgerakis highlighted Media Composer’s professional storytelling tools, 24/7 live technical support, and worldwide collaboration capabilities via integration with new technologies like Interplay Sphere. Guillaume Aubuchon is a senior post consultant at DigitalFilm Tree, a 60-seat facility currently working on NCIS: Los Angeles. In the article, he discusses why Avid remains the only choice for the highest level of broadcast and theatrical editorial. "Our clients demand efficiency," Aubuchon explained, "so for us it really comes down to the basics, which are media management and collaboration. Whether supporting large editorial environments or constructing new workflows, the fundamentals of collaboration and media management don't change. Avid provides us with the flexibility, while maintaining a level of organization that allows for greater efficiency." Read the full article to learn more. As an added bonus, you’ll also find out how Avid supports aspiring filmmakers at the Sundance Institute's Directors Lab.